Recently, we launched a cross-promotion feature that provides a simple way to help guests identify other potential activities or services of interest, and to increase online sales. The cross promote feature allows you to highlight additional trips, rental items and e-commerce categories once a guest has added an item to his or her cart. 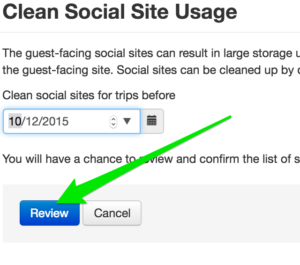 With this feature you can, for instance, cross promote camping or cabin rentals with your rafting or zipline trips. You can also promote an e-commerce category that includes guide books, maps, and waterproof bags that you offer in your e-commerce stores to help guests prepare for their upcoming trip. You can even cross promote other tours. For instance, you can suggest a zipline or rock climbing tour in addition to the rafting trip already selected by the guest. This feature allows you to suggest other offerings to the guest during their online visit by making them aware of the other services or items that you provide that are complimentary to their current selection. The cross promote feature works differently from the package feature in that no discount is required to be offered on any of the activities that are cross promoted, and you can use it to promote e-commerce categories. When using the cross promote feature, keep in mind that you do not want to promote too many other options as this can overwhelm guests with choices and may hurt conversion rates for guests moving through the checkout process. I would recommend adding no more than three options to any given trip, rental item or retail item. Also note, if you are using the package feature, you should avoid selecting the same items to cross promote as both will be displayed and may be confusing. For more information on how to use the new cross promote feature check out the support documentation and, of course, feel free to contact support with any questions. Today I want to point out one of the new email features that has been added to Arctic which will help ensure you get all the needed information and forms from guests. 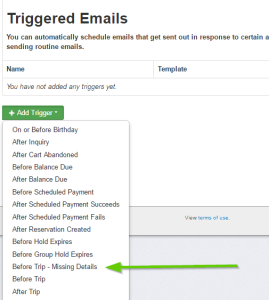 We have recently added a new email trigger option called “Before Trip – Missing Details”. 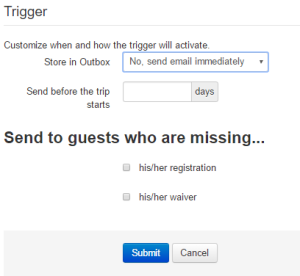 This trigger option will allow you to specifically target guests who are missing registration information or have not signed their waivers. You all know what a chore it can be to collect all of the necessary information and how much time and energy it takes from you and your staff to track down guests who have not filled out their forms. This trigger will help with that. Now, you can allow Arctic to automatically message your procrastinating guests and urge them to complete their registration and waiver before arriving. You can create as many of these triggers as you need. The beauty of the “Before Trip – Missing Details” trigger is that it will only be sent to guests who are either missing registration information, have not signed their waivers, or both, depending on how you configure it. Each “Before Trip – Missing Details” trigger can be worded specifically because your target audience will only be the guests who are missing details. Each subsequent reminder can also have the tone increase in urgency as the trip start dates get closer. The results are in and your votes have been tallied. Given the number of different ideas developed internally and suggested in our interactions with our faithful outfitters (that would be you), the survey gave us a great way to get everyone’s input to help us focus our ongoing development to ensure new features are as widely useful as possible and we continue our tradition of being a user driven software. Based on the survey results, our priorities for the new features in the coming months will be on the following functionality. So without further ado here is the 2016 development plan! (And the crowd goes wild… Ok, so that’s overboard, but you should be excited. More accounting reports, including cash flow projections: This was the most requested feature and is something that we will address soon. We have a number of new reports already in the works, including a cash flow report, a minor update to the end of day balance report and new reporting features to more easily access important date ranges. And, although not exactly an accounting report, based on conversations with outfitters at the AO conference, we will be introducing a report akin to the overview report from Version 1. Revamped discount and promotions (easier setup, e-commerce support, more control): The current system for managing discounts and promo codes, although functional, has some key limitations and is not entirely intuitive. We are going to work to improve this process by creating a more streamlined interface, adding support for one-time use codes (like those used by Groupon or LivingSocial), adding support for better per-guest promotions, adding support for per-add-on discounts and expanding discounts to other areas, such as photo sales and e-commerce sales. Up-sell items online, such as recommending additional trips or retail items when reserving a trip: Outfitters have expressed an interest in being able to cross-promote items on the guest-facing site. For day trip operators, this may mean suggesting complimentary trips or camping sites, while for other outfitters, this may mean promoting retail goods that will be useful during the trip. We are planning a cross-promotion feature that allows defining related and recommended items that will be shown after adding an activity or item to the cart. We are tremendously excited about these new features, as well as some other ones that we have been working on internally, that will be launching over the coming months. We expect some of the features to be available in the very near future and we are aiming to have versions of all of them ready at the beginning of the summer season. We will continue to refine and polish the features as they are deployed. We’ll call out some of the features in our newsletter and blog, but we recommend following our Twitter feed, as we provide timely notifications of new features and other important updates. (By default, our tweets appear on the Arctic dashboard.) If you have been following our feed recently, we are highlighting a number of updates that were recently deployed. It’s a great way to learn about new features and tools in the system. As some of your seasons are slowing down and some of your seasons have yet to kick into high gear, now is the opportune time to look at tweaking your Arctic configurations or incorporating features you haven’t previously been using or refining your use of the features you are already using. Whether you are looking to clean up your account structure for more efficient bookkeeping, implement packages, begin accepting on online waivers or tweak your evaluation forms, we are here to help. 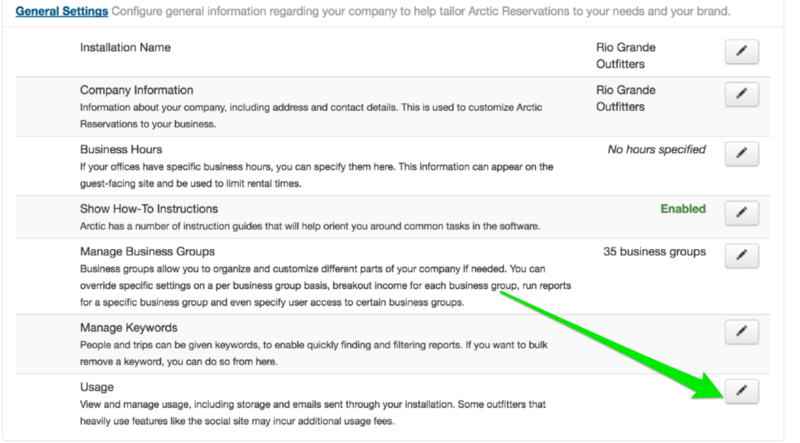 All of these features will help you manage your business and customer relations through Arctic more efficiently and successfully. Most of these optimizations are small tweaks and can be done simply but if you want to throughly clean house and get the most bang for your Arctic buck, then you may want to consider an on-site consultation. With an on-site consultation, one of our staff will visit your office, learning about the specific challenges you face and giving you guidance on the best ways to use Arctic Reservations to help with marketing, sales and operations. Now is also the time to ask those nagging questions and get advice about things that may not have gone as smoothly as you wanted them to this last season. If you feel like there are gaps in your reservation or rental process, let us know what your challenges are. Most of the time we can provide multiple options for handling the challenges presented from your particular business and then you can choose the one that works best for you and your staff. Remember the “?” is your friend. Send in your requests and let’s optimize. 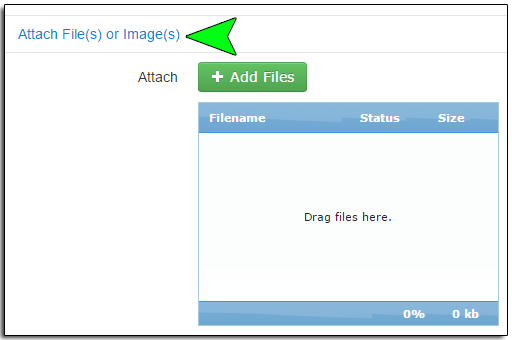 One of the most powerful features in Arctic and, until now recently, one of the least documented is the email feature. Emails are, in many cases, your most prolific points of contact with your guests and, in some cases, are the only forms of communication you may have with a guest prior to their arrival for their trip or activity. With this in mind, Arctic has you covered from creating templates and designs to customizing email senders, scheduling triggered emails and tracking external emails. In the latest update to our support documentation, we added the Email Chapter, which explain how to set up email senders, how to create awesome email designs that will reflect your company’s style, and provide some great tips to stay “CAN SPAM” compliant so your important emails reach your guests. We have even added some helpful sections for some of the commonly used advanced coding techniques, like the popular and useful “IF” statements, as well as SmartContent formatting tips. All of these tools will help you create awesome personalized and informative emails for each of your guests. Now that we have given you the tools, don’t forget to infuse your emails with your own style and “brand”. No matter what type of company you are, you all have your own lingo and style, so don’t be too hum drum with those emails. Make them reflect who you are as an adventure company. If you are running “Deliverance” style rafting trips complete with banjo music or if you are a snow cat company offering killer snow to shred, make sure your emails reflect that. Your emails should help get your guests excited about their adventure with you and when successful, help add to your mystique to make the experience truly unforgettable. Remember, your guests are coming for an adventure, so while you need to convey important information in your emails don’t forget to have some fun too. Your guests won’t forget it and will truly appreciate your efforts. If you need any help creating your email designs or templates, don’t hesitate to contact support. We are always ready to help.